The top-ranked Wake Forest Men’s tennis team is gearing up for No. 2 ranked ACC foe UVA. Wake Forest finished their last two games before the duel at the top of the rankings in an imposing manner. The No. 1 Demon Deacons played both Georgia Tech and Clemson away from home as they beat them both on their way towards last year’s ACC Championship rematch against No. 3 ranked University of Virginia this coming Friday March 31 in Winston-Salem, North Carolina. 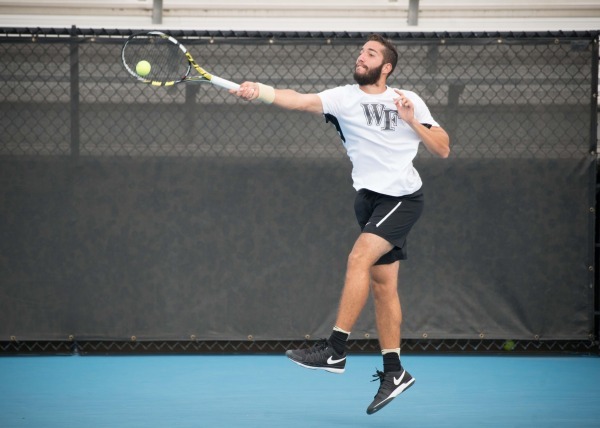 The Wake Forest men’s tennis team cruised past Clemson with a 6-1 victory pushing their winning streak to eight games. Ranked second in the country, Petros Chrysochos, from Cyprus, beat Alex Favrot 6-3, 6-3, which set the tone for the rest of the Demon Deacons. Borna Gojo, from Croatia, followed his teammates victory with a nail bitting victory 6-3, 6-7 (7-4), 1-0 (10-6) over his opponent Daffra Sanon. Skander Mansouri, from Tunisia, rounded off the team’s performance with a solid 6-4, 6-1 victory over Robert Dudley. Clemson, though putting up a good fight, was never able to get the upper hand in the matches and gave way to our strong squad in doubles. Though the No. 1 ranked doubles team in the nation, Skander Mansouri and Christian Seraphim, from Germany, had a small hiccup against their opponents, Gojo and Alan Gadjiev, along with Petros Chrysochos and Dennis Uspensky, closed out the competition with two important wins on courts two and three. Wake Forest continued its undefeated run in ACC play (5-0) and improved to 17-1 overall, while contemporarily extending their winning streak to nine games. The cherry on top was that the Deacons handed No. 17 Georgia Tech its first ACC loss of the season: we are that good. Confucius once said our greatest glory is not in never falling, but in rising every time we fall. These are no wasted words and they are perfectly applied to this situation — though behind for a good portion of the match, the Deacons beat Georgia Tech 5-2. In doubles play, this looked like any other ordinary match as our men’s team secured victories both on courts one and three securing the early lead. Chrysochos and Uspensky were the first ones finished with a 6-2 victory, closely followed by the top-ranked duo of Seraphim and Mansouri, who convinced in a 6-4 victory. However, this lead vanished as the Georgia Tech Yellow Jackets won five of their first six sets taking a 2-1 lead. Regardless, with wins on courts two, three, four, and five, Wake Forest rallied securing the win. Ranked No. 57th, Gojo defeated his opponent, Carlos Benito, 3-6, 7-5, 6-1. Uspensky outlasted Carlos Divar 4-6, 6-1, 7-6 (7-4), while Seraphim came out of a hole in the second set beating Cole Fiegel 7-6 (7-5), 0-6, 6-4.